This is the brute force method of motor control. These controllers don't have the voltage limitations that the normal winch controllers have! Rather than relying on semiconductor components to take care of power switching, these units make use of relay contacts. This means super low "on" resistance which ensures that the maximum amount of power will be delivered to your winch. 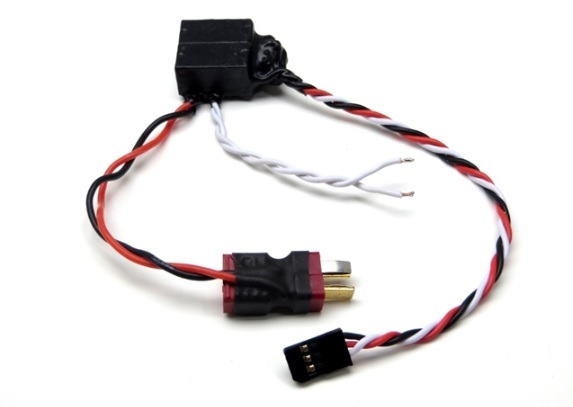 These controllers are recommended for servo winch operation but they will work on 3Racing and RC4WD DC powered winches too. The contacts in the 4 amp relay exceed 20 volts. This is way more voltage than any servo winch or 3Racing etc winch can safely work with. Keep in mind that as you increase the working voltage, you increase the current flowing through the relay contacts to your winch motor. Plug the controller into a free three position or linear channel on your receiver. Connect a battery that you want to run the winch to the other connector. The white wires get soldered to your winch motor. The controller only uses a small amount of power from the receiver to power its signal decoding electronics and to operate the relay coils. When the winch is not winding in or out, the relay contacts provide a short across the motor to "brake" the winch load which helps to keep the line from winding out. Designed to work with a radio/transmitter that has a 3-position third (or other) channel.